We've all been there: Our service member is away for deployment or TDY (temporary duty) and something major (of even semi-major) happens, and we're left to fix it and continue on with our lives like it's no big deal. That's what it means to be resilient. Let me just say that I used to cringe when someone would tell me that I needed to be resilient. I would mentally throw a dart at their face for considering that I try to "do it all" while my insides were writhing with having my husband in the Deadliest Place on Earth. I would think, "Yeah, I would love to see you try to do this all on your own while the eminent threat of danger lingers on your little family..." Over time, I had to learn the hard way of the value in learning to stay resilient. It's important for your well-being, your own goals and career to be able to pick up and carry on when catastrophe strikes. 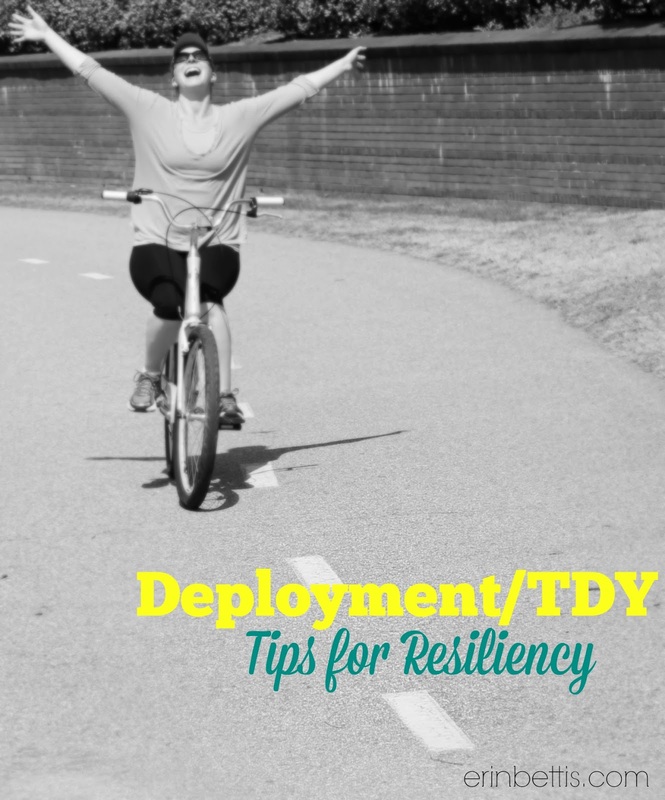 That's why I’m offering you 3 ways to stay sane while the stress, craziness, and feelings of overwhelm arise during your service member's deployment or TDY. Break free from the rigid to-do list. Now is not the time to be the “warrior spouse” by doing it all. Instead, take a step back to appreciate what you have accomplished rather than focus on what still needs to be done. For example, if you’re unable to send your kids off with a homemade class treat, try thinking about the clothes that were washed and put away or the fridge you stocked from last weekend’s Farmer’s Market trip. Focusing on small accomplishments relieves the stress of what didn’t get done. Free yourself from overindulgence with food, alcohol, and spending as those tend to increase feelings of depression. Instead, keep your thoughts focused on lighthearted tasks to help you unwind. For instance, get in deep with a classic novel or a Netflix series. Try the Pinterest recipe or craft you’ve been meaning to create. Expunge your feelings of stress onto the pages of a journal. Or, relax with a single glass of wine and a hot bath. One of the fastest ways to lift your mood is through exercise. Even a brisk neighborhood dog walk can increase endorphins and send your brain into a meditative state. Endorphins are chemicals in the body that, when interacting with receptors in the brain, “reduce stress, ward off anxiety and feelings of depression, boost self-esteem and improve sleep,” says WebMD.com. If you look at this month as a time for “you,” you’re likely to feel refreshed, not stressed, come November. A married single parent (a parent who is raising children alone while the her spouse is away) has a great deal of daily demands placed on her while the service member is away. Give yourself permission to be alone. And try not to feel guilty about it. Make it a priority to set aside time to be demand-free from children, work, and the daily have-tos. There are several ways to be kid-free. The DOD just launched a website designed for you to "see child care anywhere in the world" called MilitaryChildCare.com. Keep in mind that since this site is new, many fantastic child care providers have yet to register with the site, making it a hit-or-miss in finding care in your location. However, I believe the potential assistance this site offers is invaluable. Additionally, SitterCity.com, my personal favorite child care seeking option, offers free access into their database of reliable, local babysitters with a valid DOD registration. You can even request a background check to verify an identity. Also, the Child Development Centers (CDCs) on many military installations provide hourly care with some offering alternating Saturday care. You may even want to try contacting your local YMCA for a babysitter referral. “Call them for names and phone numbers of reliable sitters who live in your neighborhood to cut down on travel time. If you can afford a helper, consider having a high school student come occasionally to play with younger kids while you help with homework or just have some time to catch up on errands or housework,” suggests Healthy Exchange, a Dartmouth College publication specializing in health and wellness. Healthy Exchange goes on to suggest setting realistic boundaries inside and outside the home. To prevent burnout at work, try setting your hours and the amount of responsibility you feel comfortable taking. Sheryl Sandberg notes in her book, Lean In, that many employers won’t stop making demands on their employees’ time. It’s up to us to know when to draw the line and determine how many hours we work in a day. In other words, the best way to make room for demand-free time is to make the choice deliberately. To feel free from deployment or TDY ho-hum, drop the to-do list, do more of what you love, and claim your demand-free time. The long training schedule the guys are on can be tough on the families, but this circumstance shouldn’t rob you of your happiness – of which you’re 100% in control.